It’s not just if you’re a beginner either. Even people who are successful struggle with self-doubt regularly. But they have learned how to consistently resolve the feelings of self-doubt or impostor syndrome. We talk about how to overcome feelings of paralysis, what to do to keep self-doubt minimized and less likely to resurface, as well as why the phrase “could be” is keeping you from ever accomplishing anything. 00:55 I recap my experience on panel at Circles Conference. 04:12 I give a short recap of my first Sabbatical week (detailed video and blog post). 11:22 Ben talks about new job developments. 15:05 A lot of people struggle with the feeling of self-doubt. 16:33 Sean: The first place I would start if you’re feeling this way is defining “enough.” There’s an underlying sense of comparison going on. There’s some form of expectation on you. Who put those expectations there? 16:56 Are you trying to live up to someone else’s expectations of you? 18:28 Sean: What do you think people’s struggle is when they are experiencing self-doubt? What’s a common question? Would you say it’s a fear of the unknown or fear of failure or both? Instead of worrying about what you don’t know, make assertions about what you will do. Anxiety is experiencing failure in advance. 21:34 You’re making an assumption that you will fail and you’re choosing to experience that in your mind right now before having even done something. People who mentally play through the scene until a failure and say it’s not even worth trying. People who don’t really think through it at all. It’s unknown, it’s scary, and they don’t even want to go there mentally. 22:18 But what if you do decide to think about it and in that thought exercise you discover that the worst-case scenario isn’t that bad? 22:40 For instance, let’s look at a worst-case scenario. Envision two alternate universes. One is where you are right now: self-doubting. The other one is where you decide to go through with this thing even if you’re afraid. 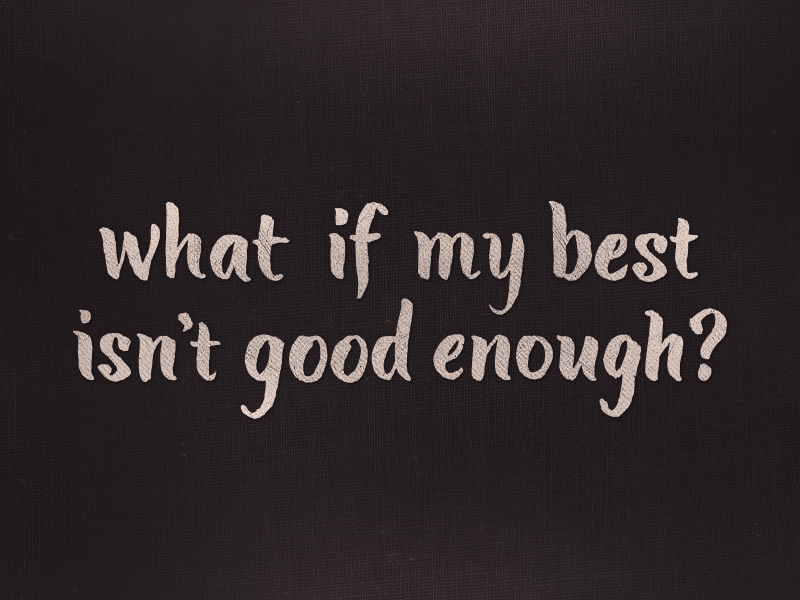 23:03 You have all of these doubts: What if I’m not good enough? What if this thing fails? What if I fall flat on my face? 23:11 Let’s say you do it and you do fail. Well, that would be frustrating. You might have to start again. You’ll certainly have some more experience, but you will have to start again. But what just happened here? You did something. You learned something. You found a way that didn’t work—that’s progress. You’ve beat inertia. Starting again is going to be even easier. 23:36 Meanwhile in Universe #1, you’re still self-doubting. What is that costing you? You’re stuck in a self-doubting positive feedback loop and you’re going nowhere fast. Self-doubters think about self-doubt a lot. What is that time worth to you? What is the opportunity cost? 24:07 Ben: “I’ve felt that feeling of powerlessness. Feeling like I can’t take a step in that direction because I don’t know what’s going to happen. It’s not just the inaction itself, but it’s also all of the creative and mental bandwidth that takes up. My thoughts can easily become consumed by something that I don’t know or understand—things I’m afraid of. I’m an emotionally-driven guy. There was a situation that came up that dropped my mood. I let this whole afternoon go by in this funk. I felt so unmotivated. 25:07 “I should have sat down and done this exercise and said, ‘Okay, what’s going to happen from this point?’ and really let it play out and come to some conclusion—negative or positive—and make a decision. Decide that if THIS happens, THIS is what I’m going to do. 25:50 Sean: Do you have any insight on recognizing the need to switch to logical mode when you’re in an emotional mood? I experience emotions but I’m also a different personality type. It takes a really long time for me to swing towards one end of the emotional spectrum or the other. If I’m ever in a really bad spot, it takes me a long time to get there and a long time to recover. That’s a personality thing, but I’m curious from your perspective if you recognize that you’re in an emotional state and you need to think about this objectively, how do you make that switch? Or is it something that just has to play out? 26:48 Ben: “I think inherent in each personality type there is a default way we handle emotion. But I think with practice, there is a certain level of control you can have over your emotions. I don’t know if trying to get over something emotionally is necessarily the goal. 27:30 “I wonder if when we deny ourselves the ability to feel something and play out those emotions if we build up some kind of emotional debt where it’s damaging. There’s a balance between trying to find a resolution for those emotions through the practice of doing an exercise like we’re talking about, and not forcing it. 28:16 Sean: No, no, it’s good. I think a lot of people are relating right now. I’m definitely relating. 29:07 Ben: “Yeah, it’s invalidating—that’s the word I was looking for. We can also do that to ourselves. We can invalidate our own feelings. I think it’s important to say, ‘It’s invalid that in this set of circumstances I feel this way right now.’ Just be honest with yourself about your feelings and validate them. Not to say ‘I want to feel this way forever,’ but saying, ‘It’s valid that I feel this way right now.’ Being able to attach it to a specific reason is sometimes one of the most difficult things. Maybe you feel a certain way and you think it’s whatever’s in front of you but that emotion is actually attached to something else entirely. That’s why they pay therapists thousands of dollars to help us get to the root of some of those things. You are an example to someone. 31:26 Whether you have a bunch of followers, or a bunch of fans, or just your own family, people are looking to you. Your friends are looking to you. You are serving as an example to someone and even if you are faking it ’til you make it right now, it can help someone. You will believe what you consistently think. You will believe what you consistently say. You will believe what those around you believe, think, and say. 32:11 Who are you surrounding yourself with? I’m not saying because you’re experiencing self-doubt and anxiety right now that you’re around the wrong type of people, but maybe you’re simply not around the right people. Go places and put yourself in situations where the right type of people are going to speak positively to you. 32:36 Sean: When you’re around people who are speaking positively to you and positively about you, you will start to speak positively about yourself. 32:52 Ben: “Yeah, it was really interesting when you and I started hanging out together more. Before I really started to see myself as a professional, my client relationships were based on me being a commodity rather than an investment. It’s not that they were saying that I wasn’t a professional, they were just doing what anyone would naturally do in a relationship with someone who didn’t see themselves as a professional. 34:46 Sean: That’s why I think it’s so important to speak positively onto people. Speak to them and treat them like they are the person that they want to be and like they are the person that they should be. 35:22 …you’re holding yourself there with your own words! You’ve got to break out of that. 35:28 Sean: I’m gonna bet that whoever’s listening to this right now doesn’t treat others that way. I’m gonna bet that you give grace to other people. I know that if someone else falls short, you’re not calling them the failure that you’re calling yourself. If you’re looking for the logic of it: you’re being inconsistent. You’re not treating yourself as good as you’re treating someone else who isn’t you. 35:57 I would say call those voices what they are: excuses. You’re not holding other people to that standard. You’re not saying those negative things to other people, you’re just saying it to yourself because you don’t want to go forward. 36:53 Sean: At its core, it’s looking externally for validation. I think that’s natural to a degree, because it can be hard to find that within yourself. It’s a self-perpetual positive feedback loop. Once you’re on the good side, it continues to be good. Once you’re on the negative side, it continues to be negative. You’re stuck. How do you get out of that? Where does the leader get that sense of direction? To be followed, you have to just lead. If you want to get out of a negative loop, you have to step outside. You have to make that first move. 38:04 Sean: Are you acting in line with your values? If you don’t know your values, you’re not going to know whether your actions are in line with them. But if your actions are in line with your values then you don’t need to worry about self-doubt. You can just say, “I’m acting in line with my values,” and you you can be sure in that. 42:48 Sean: Self-doubt is paralyzing. It keeps you from moving, it keeps you from doing, it keeps you from shipping. We’ve talked about fear of failure before (Related: e058 Fear of Failure), but I want to talk about a new concept I haven’t yet discussed. 43:08 If you’re doubting yourself, if you’re not sure you really want to do this, if you’re not sure you have what it takes, if you’re not sure you’re good enough… in the back of your mind, you might think that you want this, but really it’s just a “could be.” Yeah, this “could be.” I could do this. “Could be” never happens. “I want” is what will drive you. Saying to yourself, “I want this” is what will drive you. 43:52 Ben: “You know, that’s really interesting because I’m sitting here thinking about those things that I want—I do want them—but I think about them and talk about them as things that COULD be. 44:35 Sean: It’s the “I want” paired with action. 45:41 Sean: Yeah! You’re saying you want this thing, but do you want it enough to act while you’re in this place of self-doubt? Did I give it my best? Am I following through with my commitments? Am I willing to iterate and move forward? Am I choosing to learn from experiences—win or lose? 49:40 Successful people still struggle with self-doubt. Why? Because successful people push themselves and successful people keep learning. That means they’re constantly pushing forward and putting themselves in situations where they are challenged. They may feel like they’re not good at it, or they’re faking it—we all deal with impostor syndrome. But what successful people have learned to do is acknowledge the feeling and then ask themselves the above questions as a quick check. 50:21 When the answer is “yes,” they know they’re doing the right thing. When the answer is “yes,” they move on. They allow it to serve as a motivator rather than an inhibitor. They don’t dwell on it. Remember: self-doubters spend a lot of time thinking about self-doubt. 50:53 Sean: You’re anxious, you’re worried, it’s eating you up, but now you know why. You’re aware of where you are and you recognize that you’re stuck in a loop of self-doubt. This is where Ben would say to take 10 breaths. 51:12 Sean: That’s a long time. It took me like a minute to take four or five breaths. 52:01 Sean: If you want to get rid of anxiety, the first thing is recognizing where you are. Part of being anxious is feeling like you don’t know a lot of things. You don’t know what the outcome is, you don’t know what the problem is, you don’t know where you are, you don’t know where you’re supposed to be going. 53:22 Sean: You’re not always going to know before moving forward, but that’s why I say to establish your values and make sure you’re acting in them. Then move. You’re not going to know the outcome of everything beforehand. If you’re waiting for the guarantee, you’re going to wait forever because there are no guarantees. You just need to be acting in your values. 54:02 Sean: Know your time-wasters. If you’re feeling like you’re stuck, you probably have these go-to time-wasters that serve as an escape because it’s not a really fun place to be. But like we said, it has to start with action and you’re only going to act if it’s a thing that you do. It has to be something that’s on the schedule. Get them out and go to the action instead. 54:38 What is the action that’s going to bring you out of this loop of self-doubt? Now schedule that thing. 54:44 Recognize the environments in which you most commonly doubt yourself. It could be a place, it could be other people, it could be a thing that you do. Put yourself around people that are going to speak positively to you. 55:00 Like you said, Ben, you have to create movement. You’ve got to start. Sometimes you might need education. It’s very possible that you’re not sure about moving forward because you simply aren’t sure or don’t know something you need to know. You’re not educated. I’m not necessarily talking about traditional education, it could just be researching or educating yourself about a particular scenario before you can make a good decision. Sleep. It’s absolutely critical to conquering self-doubt.